The Targus 4-Port USB 3.0 SuperSpeed Hub features the new and powerful SuperSpeed interface technology that revolutionizes the way we move data from devices to computers. Access data and transfer files up to 5GBps, copy large amounts of video, movies, music, photos, and data at lightning fast speeds. Compatible with PC, Mac, and Netbooks, this ultra powerful hub allows for easy connection from the hub to your USB enabled computer with a 5- foot cable. Ideal for connecting hard drives, docking stations, mice, flash drives, iPod/MP3 players and more. The hub includes a 4A AC adapter for when additional power is needed. The compact design makes it easy and convenient for travel without sacrificing its functionality. • A compact design makes it easy to transport anywhere. 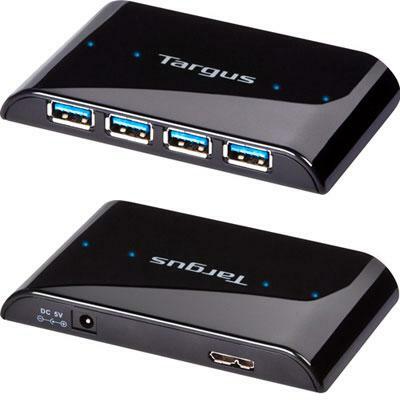 • Designed to support up to four USB devices.